Is this a wolf in, er, wolf's clothing? 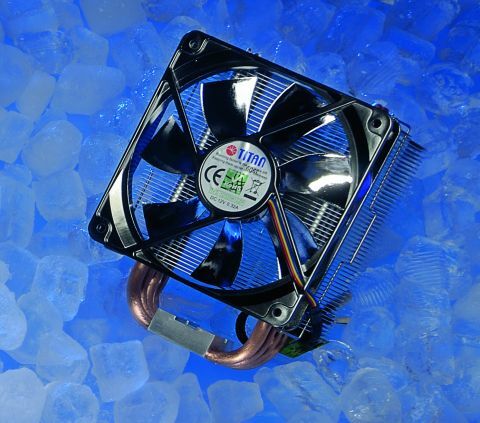 If you're going to stress Intel or AMD's latest processors then you'll need a heavyweight cooler. Named after the monstrous wolf from Norse mythology, Titan's Fenrir sports a suitably heavy-metal wolf-head motif and certainly looks like it means business. The heavy-metal theme is not uncommon with coolers – witness Scythe's Yasya and Xigmatek's ridiculously-named Thor's Hammer. Fenrir is big beast, too, standing 165mm proud of the motherboard. The width means you'll need to watch it fouling your RAM, especially if your sticks have heat spreaders on top. The Fenrir has four 8mm heat pipes with Direct Touch, where the pipes are in direct contact with the top of your processor to maximise heat transfer. On top is a nice big stack of aluminium fins that have, it says here, a unique low drag coefficient. Okay, whatever. It fits Intel LGC 775, 1156 and 1366 and well as AMD's AM2 and friends, and boasts a maximum TDP of 160W, above any desktop chip's requirements. Coolers can be troublesome beasts to fit, but the Fenrir shows how it can be done to be both secure and easy. Intel's four-point fixing used knurled nuts you can tighten by hand. Unusually it eschews AMD's usual clip fitting, and instead you remove the retention frame and screw the cooler directly onto the board, which is much more secure. We've no problems with the performance. It kept our test system down to 43.25 degrees at idle and a cool 53.25 degrees under load, compared to the Freezer 7 Pro (49.50 and 65.25 degrees), that's good work and only a little less efficient than the engineering masterpiece that is the Noctua D14. The PWM fan is commendably quiet too. It only fits on one side, though, so no two-fan action. This is a big cooler for big systems. There are perfectly adequate cheaper and smaller alternatives that will suit most systems better, so are you sure you need such a monster? That aside, there's little not to like. The fittings are sturdy and easy to use, the performance was well up to muster and the price, well, not bad at all. It does have a certain style too. Good dog.